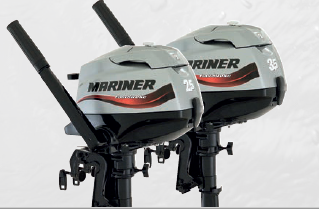 Mariner 2.5hp outboard engine – never before has portable power seemed so perfect. The 2.5hp FourStroke may be small, but it’s filled with big ideas. Both engines feature neutral and forward shift and a tiller steering that rotates 360 degrees and a twist grip throttle for maximum manoeuvrability and one hand control. Plus a very clearly visible sight gauge makes it easy to monitor and maintain a proper oil level. Through prop exhaust buries the engine noise underwater. 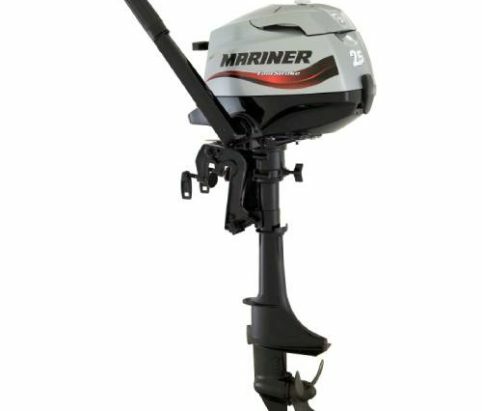 4 trim positions plus shallow water drive allow easy access to remote areas. Vibration isolated twist grip throttle provides a smooth interaction with the engine. CDI ignition offers maintenance-free dependability and easy starting. Superior corrosion protection provides longer life. Visual low pressure warning system. Decompression system for quick, effortless one handed starting.